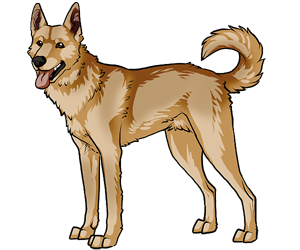 The Canaan Dog originated from the Land of Canaan in Israel. It has been around since Biblical times. It was originally a guarder and herder for the Israelites. More than 400 of the best Canaan Dogs were trained to be mine detectors for the Middle East Forces during the WWII and Israel's War of Independence. In 1965, four Canaan Dogs were imported to California to begin reproduction of the breed in the U.S.
Dr. Menzel, the breed's specialist, gave the breed its name. It uses its tail for balance. Canaan's are one of the healthiest breeds; it hardly ever needs to go to the vet except for routine visits! Was the first breed trained to detect mines. You have to earn their respect before they will give you their devotion.